Charles Rennie Mackintosh lived from 7 June 1868 to 10 December 1928. He was an architect, designer, and watercolourist who was strongly associated with the Arts and Crafts movement, and who became the main exponent of Art Nouveau in Scotland. Never as successful or as recognised in his day as he should have been, he has since gone on to become an hugely influential icon, a superstar of the design world: a man now widely, if belatedly, celebrated in Glasgow, the city which he left in despair in 1914. The wider picture in Scotland at the time is set out in our Historical Timeline. Mackintosh was born in in the Townhead area of Glasgow in 1868, close to Glasgow Cathedral. He was the second of eleven children of a Police Superintendent. At school, Mackintosh had great difficulty reading and writing. He would probably be recognised today as dyslexic: in the 1870s he was simply regarded as slow. Coupled with a lifelong limp caused by a foot disability, he seems to have had considerable difficulty fitting in at school. In 1884, at the age of 16, Mackintosh became an apprentice to an architect called John Hutchison. He was to work there until 1889, when he moved to the long established and prestigious architectural practice of Honeyman and Keppie. Throughout this time Mackintosh attended evening classes at the Glasgow School of Art, where his talents at last began to be recognised. It was through the School of Art that in 1888 he gained his first commission as a professional, and won a prize from the Glasgow Institute of Fine Art, for a design for a terraced house. 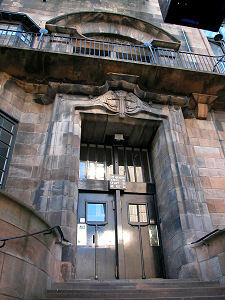 It was also at the Glasgow School of Art that Mackintosh met the three people who were to be highly influential on him. These were the sisters Frances and Margaret Macdonald, and the draughtsman, J Herbert McNair, who also worked for Honeyman and Keppie. Together they became known as The Four and eventually went on to exhibit their artworks in Glasgow, London, Turin and Vienna. What became known as "The Glasgow style" went on to strongly influenced the Viennese Art Nouveau movement. In 1899, J Herbert McNair married Frances Macdonald, and in 1900 Mackintosh married Margaret Macdonald. Meanwhile things progressed steadily on the architectural front. In 1890, Mackintosh's design for a public meeting hall had won him £60, which he used to fund 3 months' sketching in Italy. 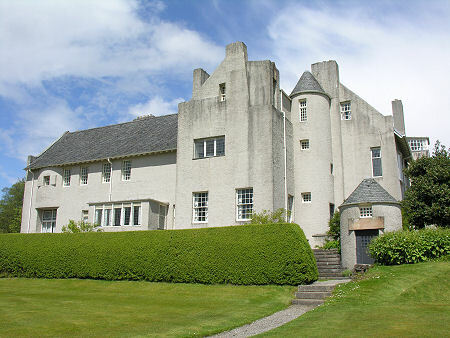 By 1904 Mackintosh was well enough established with Honeyman and Keppie to become a partner, and he became a member of the Royal Institute of British Architects in 1906. 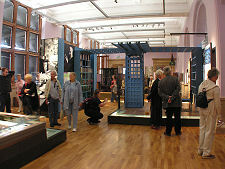 It was during the ten years either side of 1900 that most of the classic buildings associated with Mackintosh emerged. The Glasgow Herald Building was completed in 1895; Ruchill Free Church Halls were completed in 1899; Queens Cross Church opened for worship in 1899; Kate Cranston's Willow Tearooms opened in 1903; Hill House in Helensburgh was completed in late 1903; The Daily Record Building was completed in 1905; The Glasgow School of Art was completed in stages between 1897 and 1909; The Scotland Street School was completed in 1909; and The House for an Art Lover was designed in 1901, though it was not built until the 1990s. Mackintosh's attention to detail was fanatical: in the Scotland Street School, for example, hot water pipes were routed below the coathooks, meaning that pupil's coats were warm and dry at the end of the day. But this attention to detail, which some have attributed to borderline autism on Mackintosh's part, also meant that the projects he led were seldom if ever profitable. 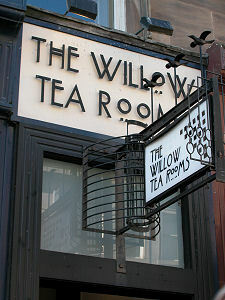 After 1910 commissions were fewer and further between, and Mackintosh turned to alcohol. In 1913 Mackintosh resigned his partnership with Honeyman and Keppie, and in 1914 he and Margaret set up home in Walberswick, on the coast of Suffolk. This was bad timing: after the start of World War One, exotic strangers with bohemian lifestyles, strange accents and who received letters from abroad were treated with considerable suspicion in southern England. In 1915, after their Walberswick home had been searched by MI5, Charles and Margaret moved to Chelsea. Artistic commissions were scarce in wartime London and they had great difficulty paying the bills, only surviving by turning to textile design and by selling paintings to friends back in Glasgow. Amongst those friends, and also living Chelsea at the time, was the Scottish artist John Duncan Fergusson. In 1923 Charles and Margaret moved to southern France, to benefit from the warmer weather and the cheaper prices. Mackintosh turned to watercolour painting, intending to mount an exhibition in London. His attention to detail made him a very slow painter, but he had completed 40 paintings by the time he returned to London in 1928, for treatment after complaining that smoking French tobacco was hurting his mouth. He was diagnosed with throat and mouth cancer, and died on 10 December 1928. The story of Charles Rennie Mackintosh can be summed up by the valuation placed on four chairs he had designed that were amongst his belongings when he died. They were described as "practically valueless". In more recent times chairs designed by Mackintosh have sold at auction for more than £100,000 each.